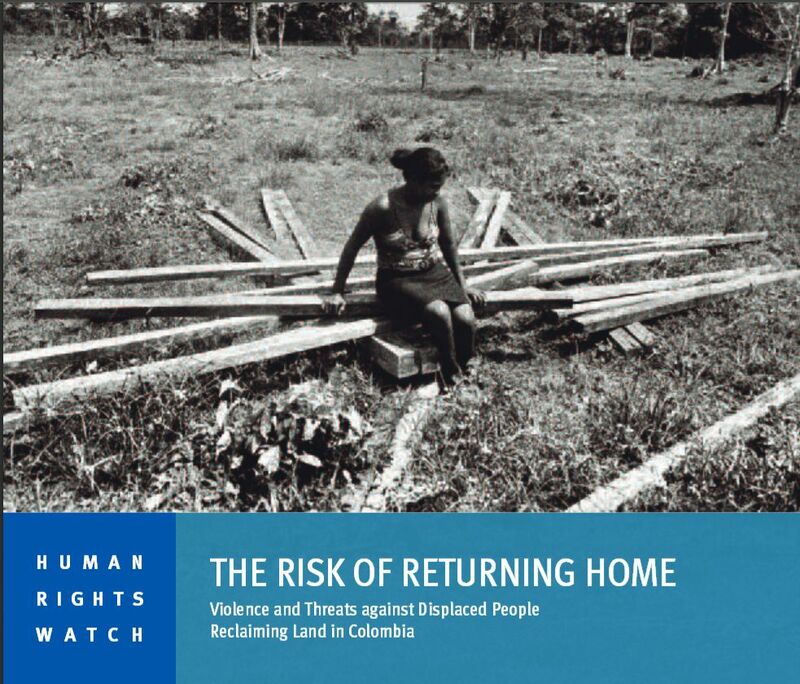 This 184-page report documents killings, death threats, and new incidents of forced displacement committed against displaced Colombians in relation to their efforts to recover their land. Many of those targeted are reclaiming property through the Victims Law, which was enacted by President Juan Manuel Santos in 2011 to restore millions of hectares of stolen and abandoned land to displaced people. Over the past 30 years, abuses and violence associated with Colombias internal armed conflict have driven more than 4.8 million Colombians from their homes, generating the worlds largest population of internally displaced persons (IDPs). Mostly fleeing from rural to urban areas, Colombian IDPs are estimated to have left behind 6 million hectares of land­roughly the area of Massachusetts and Maryland combined­much of which armed groups, their allies, and others seized in land grabs and continue to hold. Dispossessed of their land and livelihoods, the vast majority of Colombian IDPs live in poverty and lack adequate housing. In June 2011, the administration of President Juan Manuel Santos took an unprecedented step toward redressing this immense human rights and humanitarian problem by securing passage of the Victims and Land Restitution Law (Victims Law). The law established a hybrid administrative and judicial process intended to return millions of hectares of stolen and abandoned land to IDPs over the course of a decade. The land restitution program represents the most important human rights initiative of the Santos administration. If implemented effectively, it will help thousands of families who have been devastated by the conflict to return home and rebuild their lives, while also undercutting the power of armed groups and criminal mafias. Already, the governments Restitution Unit has made notable gains in carrying out the law in some regions. Despite this progress, major obstacles stand in the way of effective implementation of the law. IDPs who have sought to recover land through the Victims Law and other restitution mechanisms thus far have faced widespread abuses tied to their efforts, including killings, new incidents of forced displacement, and death threats. Since January 2012, more than 500 land restitution claimants and leaders have reported being threatened.